The bright gold highlighting on the words contrasts the forest green background for a classic color combination. Additional gold flecks mottle the background, allowing the sign to glint in the sun. Use the included 16.75" long mounting stake to place this plaque in the ground. Made from recycled cast aluminum, this sign will surely last for several years. 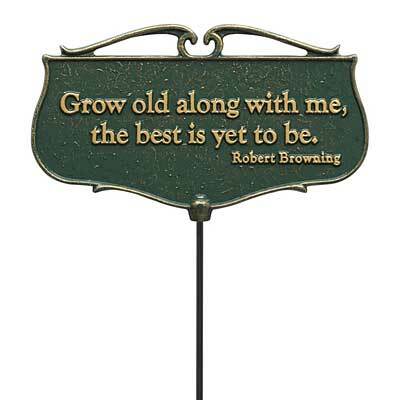 Watch your garden age gracefully, enhanced by this Garden Poems Plaque.